banner image: 5K start at 2013 Troy Turkey Trot. Corn stalk runner at 2017 Troy Turkey Trot. Join the Most Popular Strutting Day! What I enjoy most about Thanksgiving is that it is a relaxed, all-American holiday. And what is more American than our plucky, ungainly turkey? Granted, although Ben Franklin lost his bid to elevate our native species to national symbol status, the turkey gets the last cackle. For when was the last time you celebrated eagle day? In a wishbone world, Thanksgiving gives the least offense. Sure, it is a worry for turkeys but a trade-off if you consider all the free publicity. While slightly distasteful for vegetarians, there are all those yummy sides and desserts to consider. Best of all is the emphasis on family members, from toms to hens to the littlest turklings (think ducklings). Our nationwide obsession with turkey trots is ample evidence. While there are always some competitors whose main goal is to run fast enough to dodge the bullet, most are content to relax and herd the remainder of the extended flock. Even the renowned Saratoga Streaks have been spotted uncharacteristically back in the pack. As our coaches are wont to insist, successful races require an adequate warmup. Pre-Turkey Trot, then, consider joining Fleet Feet Albany’s 24-Hour Fight Against Hunger from 3pm on Friday, November 16 to 3pm on Saturday, November 17. The route consists of one-mile loops and you are welcome to do as many as you like. Some stay the entire time, enjoying a happy hour presented by Shmaltz Brewery, a Via Fresca pasta dinner, and a breakfast from Mizuno. On Thanksgiving Day, Thursday, November 22, get ready for the most popular running day of the whole year. Sample one of these six races in our area. While most trots cater to the 5K crowd, perfect for strollers, aspiring turklings and elders, the premiere 71st annual Troy Turkey Trot is the only area race where it is still possible to double your dinner capacity with an out-and-back 10K run, along with the traditional 5K. For an early kitchen turnaround choose from a flat 5K, the Grade School Mile or the Turkey Walk. Harkening back to ragamuffin days of old when children in Brooklyn and Queens neighborhoods dressed up and begged door to door, all Thanksgiving events encourage costumed runners and make perfect entertainment as you pass turkeys, pilgrims, superheroes and the occasional healthy choice banana. Troy, however, has a more formal contest, with dollar greens for the winners. To further enhance the feel-good vibe, there are opportunities to form family running teams like mother/daughter, brother/brother, husband/wife, etc. With all these events, and with the estimated 8,000 runners from 37 states descending on the Collar City it makes sense that trotters seriously consider the early farm-to-table packet pickup, although there is day-of registration, unusual for such a large race. Participants are also encouraged to donate online to the Regional Food Bank of Northeastern New York and Joseph’s House & Shelter. If you are a seasoned runner and yearn for more challenging terrain with which to stockpile your calorie deficit, sample downtown Saratoga Springs’ 17th annual Christopher Dailey Turkey Trot 5K Run/Walk which circles Skidmore College’s hills, ending with a leg-turning Broadway downhill. As with all other Thanksgiving races, the early bird catches the worm motto applies, and the estimated 3,500 trotters can anticipate an early start time, leaving ample room for parades, eating and football scrimmages. Once more, Ainsley’s Angels riders and pushers will start off the festivities with a one-minute head start. 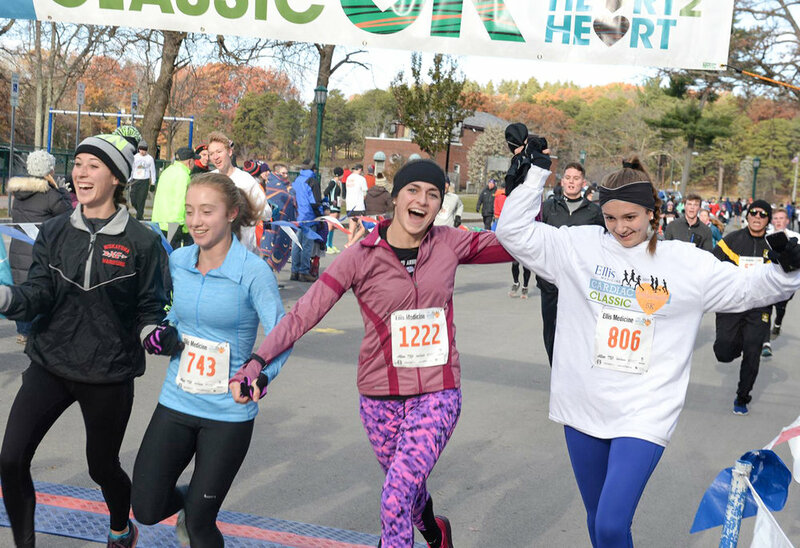 Our second oldest Thanksgiving event is the 37th annual Ellis Medicine’s Cardiac Classic 5K which benefits the Visiting Nurse Service of Northeastern NY. Perfect for city turkeys who wish to vary the pavement with a green loop around Duck Pond, the Classic starts from Central Park in Schenectady and offers a sentimental reminder of summertime picnics and playground dates, the perfect fattening-up season. Unlike other trots, the 5K is reserved exclusively for the fittest birds, although occasional Galloway-style walking breaks are permitted. For an even more laid-back attitude, sample the Our Towne Turkey Trot 5K where “the only time that will matter is the good time that you’ll have, while helping to support our Bethlehem Food Pantry.” Starting out at the Bethlehem Middle School in Delmar, the 5K is a mixed breed, self-timed event where crowded beak-to-beak starts are optional. Another race with a small town feel is the seventh annual St. George’s Turkey Trot 5K Family Run/Walk. Intended for southern Saratoga County residents who wish to think local and avoid traveling to the bigger venues, the Tony Lauria Memorial Race benefits the St. George’s Scholarship Fund. If you long for a city turkey/country turkey twist, then exercise your navigational skills by flying to the 22nd annual Running of the Turkeys 5K Run/Walk launching from the Fisher Elementary School in just over the border Arlington, Vt. The scenic country roads will challenge even turkeys in their prime with real Vermont hills a-plenty. So shorten your roosting time, groom your feathers, and follow the crowd to join the most popular strutting day in the entire United States. Sides, anyone? Laura Clark is (snowshoegal133@gmail.com) of Saratoga Springs is an avid trail runner, ultramarathoner, snowshoer and cross country skier. She is a children’s librarian at the Saratoga Springs Public Library.